Hawaii is more than just pristine beaches: it's also home to some incredible sweet treats. Lee Anne Wong serves sweet brunch specialties at Koko Head Cafe, while Via Gelato blends Hawaiian flavors with Italian techniques to make innovative frozen sweets. And renowned Vietnamese restaurant The Pig and the Lady serves out-of-the-box creations at their dessert bar. Anyway you fry it, America loves donuts, and these three shops are a cut above the rest. There are vegan delights at Donut Friend in Los Angeles, with everything from berries and mint to donut sandwiches; at Underwest Donuts in New York, they prove you can have your Halva Tahini donut and eat it too; In Honolulu, Champion Malasadas serve up Portuguese-style donuts fried to order and covered in sugar. These frozen treats go far beyond vanilla, chocolate and strawberry scoots. In Honolulu, Shimazu Store pushes the boundaries of shave ice, a uniquely Hawaiian treat. In New York, Ice and Vice uses unconventional ingredients to create edgy desserts for adult palates. In Burbank, Calif., Quenelle is changing the rules of the frozen-treat game, with creations including ice cream sandwiches with fresh, hot, funnel cakes. We've got the fried, the frozen, and the fabulous! It's a tour of the sweetest spots in Los Angeles. At Republique, French pastries are expertly crafted, and totally addictive. The Pistachio Raspberry Kouign Amann is like California summer wrapped in a buttery and oh so flaky dough. And you'll love unwrapping the Cherry Pistachio Braid layer by sugary layer until you reach the sweet creamy filling inside. At Churro Borough, Mexican flavors add something extra special to their unique frozen treats. Their version of an ice cream sandwich pairs artisanal ice cream with two warm, flaky deep fried pastry disks. Then we check out the unique cloud cakes at Bo Nuage. Each cake has layers of crunchy meringue and creamy whipped topping and is coated in cake crumbs, nuts or chocolate curls. They are light as air! Every so often a restaurant shakes up the world of sweets. In this episode we visit three of NYC's game changers, putting a new spin on old favorites. At Dominique Ansel Kitchen time is the secret ingredient: desserts are made to order instead of ahead of time. So the classic French pastry mille-feuille is freshly piped with thick, luscious pastry cream, and the Yuzu Lemon Tart is filled to the brim with freshly-blended citrusy yuzu-lemon curd. At Good Batch, a passion for cookies has evolved into groundbreaking ice cream sandwiches, like the deconstructed candy bar called the Macaroon Ice Cream Sandwich: creamy vanilla ice cream sandwiched between coconut almond macaroons and layered with chocolate caramel and almonds. And the frozen desserts at Snow Days make childhood dreams come true: feathery shavings of flavored frozen creams in inventive flavor combinations, such as the Yeti Food: blueberry and chocolate sandwich-cookie flavored shaved cream topped with ripe bananas, crushed waffle cones and blueberry puree. If you are looking for some Low Country Love in the form of a sweet treat, look no further than Charleston, South Carolina. At Callie's Hot Little Biscuit, they are baking up, over the top, warm doughy rounds like the Cinnamon Biscuit, that is slathered with cinnamon butter and topped with three different kinds of sugar and the Blueberry Biscuit that's served with a big dollop of buttercream and sugared blueberries. At Brown's Court Bakery, they push the boundaries of baked goods with items like their Peanut Butter and Sriracha Croissant and their Caramelita Bar which is part blondie, part brownie and part cookie. 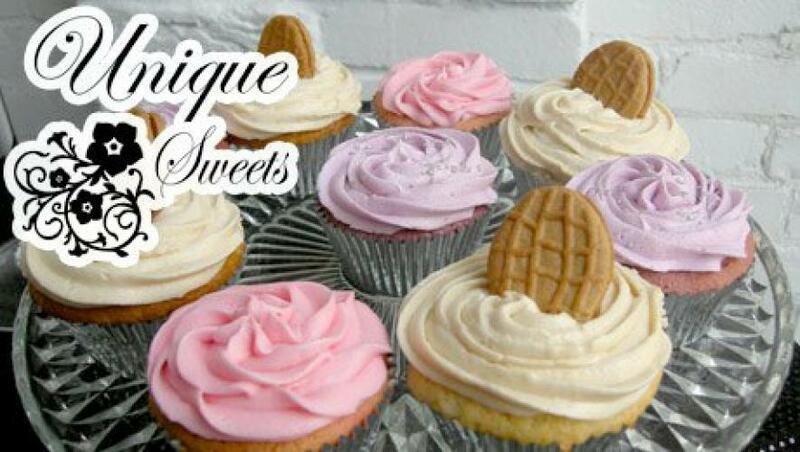 And good things come in small packages at Sweet Lulu's Bakery on Wheels, where you can order Coconut Cake in a Jar or even, Wonder Chick, a small, sweet and salty chocolate cake topped with peanut butter buttercream. Blueberry donuts and sweet potato ginger glazed donuts from Holy Donut; a kolache pastry with three kinds of berries and orange rolls from Kolache; carrot cake pancakes and fried chicken and waffle sandwiches at Dixie Supply Bakery and Cafe. Discovering unique sweets in the San Francisco Bay area; why people are raving about the pies at Pietisserie in Oakland; a ruby red beet pie that brims with roasted beets, mashed and mixed into a creamy sweet filling. We're in New York City, discovering the places that are serving up the most unique sweet treats from around the world. In Red Hook, Brooklyn, check out La Newyorkina. At this Mexican sweet shop, they specialize in paletas, which are ice pops made with fresh fruit. Try the the milk-based Fresa Fields Forever, which has whole chunks of ripe, sugary strawberries and pieces of buttery cookies. Or slurp the Chamoyada: a sweet, tart, spicy, yet surprisingly addictive answer to the snow cone. On the Lower East Side we sample Thai street sweets at Juicy Spot Cafe. Here, they make ice cream to order on a special cold plate, curl it into thin rolls, and finish it with a variety of unique toppings. With flavors like green tea, and toppings like grass jelly and dragon fruit, these are sundae's with exotic flavors and textures that will keep your taste buds intrigued and happy . At Mocu-Mocu in Hell's Kitchen, they make a Japanese street sweet called Obanyaki. These are stuffed pancakes that are made to order in a special cast-iron mold. The Apple Compote and Custard Cream Obanyaki tastes like a warm slice of apple pie a la mode: a sweet, tart, and creamy filling surrounded by a warmly-spiced, hand-held pancake that's crispy on the outside. We're going on an ocean-hopping journey from Hawaii to the mainland for some magnificent morning munchies. We start with sweet unique ways to add fruits and veggies to your morning meal with a tropical Breakfast Bruschetta, Blue Corn Zucchini Bread, and a Strawberry Mint Hand Pie that will have you practically jumping out of bed. Next, a dizzying array of donuts from Glazed, Chocolate Malasadas, Apple Fritters and a Donut Cake! If you're wanting something a little lighter, cozy up to some Cinnamon Sugar Pie Crisps or a multigrain Muesli Toast with nuts, berries, honey and green-tea custard. Rise and Shine...It's Unique Sweets!!! Everyone loves familiar treats like cakes, cookies and ice cream, but some chefs are pushing the envelope with "next level" sweets. We sample nine of these cutting-edge creations, including the Coconut Cremeaux at The Pig and The Lady in Honolulu: an edible fantasy landscape with creamy chocolate mountains, "rocky" earth of candied sesame, and a forest of blackberries and nasturtium leaves. In New York City the creator of the world-famous Cronut is upping his game with a restaurant where desserts are made to order, like the Whole Vanilla Bean Ice Cream. And Charleston's Sweet Lulu's Bakery on Wheels puts a new spin on classic Southern comfort with its updated cakes made in travel-friendly glass jars, including the Raspberry Ice Box Cake.